Light up the night and lift holiday spirits wearing a funky GIANT SIZE CHRISTMAS LIGHT BULB STRAND HOLIDAY FLASHING NECKLACE! 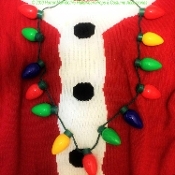 Festive 38-inch (95cm) long LED Necklace makes a great stocking stuffer, funny Elf on a Shelf costume jewelry, Ugly Tacky Christmas Sweater party accessory and secret Santa gift. Wear to Raves, for Mardi Gras, on New Year’s eve, pass them out to your co-workers to spread holiday cheer, or leave them out for party guests to take while enjoying that egg nog. Big Yard-Long Jumbo Blinking LED Light Strand Necklaces will keep you and Santa’s elves rockin' around the Christmas tree! To activate your LED Christmas Lights Necklace, press the tiny button on the battery pack. Simple function, just depress the button once, twice, or three time to cycle through the settings and four to turn it off. Oh Christmas Tree, oh...wait, that's you! When you're wearing this Christmas Lights Necklace, you'll get everyone in the holiday mood. Whether it's a Secret Santa at the company holiday party, caroling with neighbors, tacky ugly sweater party, bar crawl or gathered round the tree with family or friends, you'll be all aglow. Dress in your Christmas finery, and set the lights a twinkling.